Connect Filter is a web re-director for Windows clients and devices. It enables you to enforce your organization's web content filtering policy on devices owned by your organization, wherever they are located. By installing Connect Filter on devices, users' browsers are forced to send web content requests to Smoothwall proxies. Smoothwall proxies then enforce your organization's web content filtering policy by blocking undesirable and malicious content. Note: Mac OS and iOS clients and devices, and those Windows devices using the older version of Connect Filter, use Smoothwall's MobileProxy feature to communicate with the Smoothwall — see Starting MobileProxy . The following instructions are for version 3.0 and above of the Connect Filter for Windows service only. When Should I Use an External Interface with Connect Filter for Windows? Typically, you would use an external interface for those Connect Filter for Windows clients and devices that are taken off-site. When Should I Use an Internal (Basic) Interface with Connect Filter for Windows? Use internal interfaces for Connect Filter for Windows devices and clients that are logged directly into your network. What About Other Interface Types? Bond interfaces — Treat as external interfaces. It is recommended you enable the "parent" bond interface for use with Connect Filter for Windows Client, and leave the bonded interfaces as unavailable for use. Depending on where the Smoothwall sits on your network, you may need to setup a port forward on your Internet Services Provider's (ISP) router to redirect Connect Filter for Windows traffic to the correct port on the Smoothwall. Bridge interfaces — Treat as external interfaces. It is recommended you enable the "parent" bridge interface for use with Connect Filter for Windows, and leave the bridged interfaces as unavailable for use. PPPoE interfaces — Treat as external interfaces. VLAN interfaces — Treat as internal interfaces. For a detailed description of each of the above interface types, see Working with Interfaces and Roles . Should your Smoothwall solution make use of a load balancer, you can use the virtual IP address assigned to the Smoothwall service as a Connect Filter for Windows interface. You configure such addresses in the Web proxy > Web proxy > Settings page (see Load balancing ) before they can be used in the Guardian > Client interfaces > Connect Filter page. 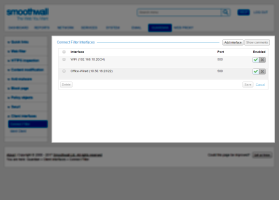 Should your Smoothwall solution make use of a load balancer, you can use the virtual IP address assigned to the Smoothwall service as a Connect Filter for Windows Client interface. You configure such addresses in the Web proxy > Web proxy > Settings page (see Load balancing ) before they can be used in the Guardian > Client interfaces > Connect Filter page. For more information about configuring GPOs, refer to your Active Directory documentation. By default, all interfaces configured on your Smoothwall are available for use with Connect Filter for Windows, but must be explicitly enabled for use. Go to Guardian > Client interfaces > Connect Filter . • Interface — From the drop-down menu, select the relevant interface. • Port — Enter a TCP port number between 1 and 65535 inclusive. By default, this is set to 1080 which is the registered port for a SOCKS proxy (which is the type of proxy Connect Filter is). However, you may find your Windows clients and devices are blocked from communicating with the Smoothwall when outside your network, and therefore cannot browse to the Internet. Typically, this is because the majority of public networks, such as those found in hotels and WiFi hotspots, block traffic from using port 1080. Ensure the configured port number is accessible from all workstations that have the Connect Filter for Windows installed. 81 and 441 Used to access the administration UI. You cannot enter these ports in this field to prevent you from being locked out the UI. 222 Used to access the Smoothwall over SSH. You cannot enter this port number in this field to prevent you from being locked out of accessing the Smoothwall. Any port number used in a Guardian authentication policy Guardian authentication policies are configured in Web proxy > Authentication > Policy wizard — see Creating Authentication Policies. 80 and 443 Used by the User portal, Reverse proxy, and SSL VPNs. 800 Default port used by the Guardian web filter. 25 and 587 Default ports used by the Anti-Spam relay. • Comment — Enter an optional description for this interface. Tip: If required, you can configure multiple interfaces to communicate with the Connect Filter for Windows Client or . However, you must ensure all interfaces are configured to use the same port number. Tip: If your Smoothwall solution also makes use of the IDex Client (see Setting Up IDex Client Interfaces) feature, you can use the same interface to communicate to both proxy-client applications. However, they must use different port numbers. Should you attempt to configure the same interface / port number combination as the other proxy, a validation error is displayed to you. From the Interfaces table, mark the relevant interface. Adjust the configuration as required. For a detailed description of each setting, see Enabling Client Interfaces. By default, new interfaces configured for use with Connect Filter are given an enabled state. You can choose to temporarily disable interfaces, without removing them from the configuration. From the Enabled column, click the grayed-out cross. This changes to a red cross and grays out the green tick, therefore removing that interfaces' availability for use. Conversely, clicking the grayed-out tick makes that interface available for use again. Proxy exceptions are those domains, hosts, or IP addresses that are used by the client devices, but do not require going through the Smoothwall proxy server, for example, those hosts serving Windows' updates.